Fourteen people were in a truck police say is linked to human smuggling. (CNN) -- Two people were arrested and 12 others were taken into custody Tuesday following a police chase in Phoenix, Arizona, in what authorities described as a human smuggling incident. "The truck arrived into the U.S. just this morning from Mexico," said James Holmes, spokesman for the Phoenix Police Department. "It is a human smuggling incident." The chase began in southeast Phoenix at about 5:15 a.m. and wound up on the city's west side, said Robert Bailey, spokesman for the Arizona Department of Public Safety. Fourteen people were in the truck -- nine in the truck's bed, three in its extended cab and two up front, Bailey said. All were undocumented immigrants, he said. The truck's driver along with its owner, who was also in the vehicle, were arrested and face charges of human smuggling and felony flight, Bailey said. Authorities attempted to stop the truck after officers saw it tailgating other motorists on Interstate 10 westbound, Holmes said. The truck pulled over, then took off as a Department of Public Safety officer approached. The officer chased it but backed off as instructed after the truck began driving erratically, he said. 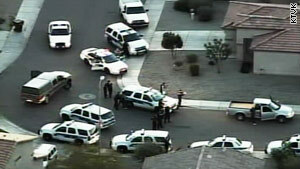 Police lost the truck, and a chopper from CNN affiliate KNXV-TV in Phoenix helped them find it, Holmes said. Meanwhile, the truck also happened to pull up next to another Department of Public Safety officer and took off again, using surface streets for a while and getting on and off the interstate, nearly running over a motorcycle officer, Holmes said. Phoenix police finally stopped the truck. "One after another, people start getting out," Holmes said.